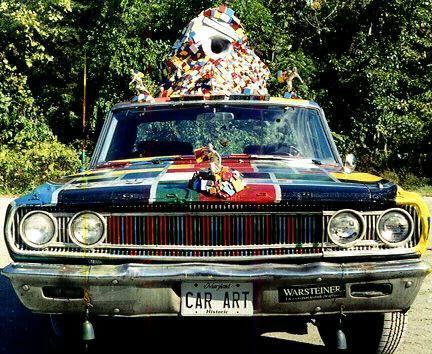 Bowling for Mondrian started out life as an ordinary 1965 Dodge Coronet with a slant 6 engine. A fun car....but ordinary. This view shows the bells under the front bumper, bowling trophy hood ornament and roof ornaments,car name spelled out in blocks over windshied and the Monolyth of unordered blocks, display area and alto horn.